Today I’m sharing another set of Color Me Readers. 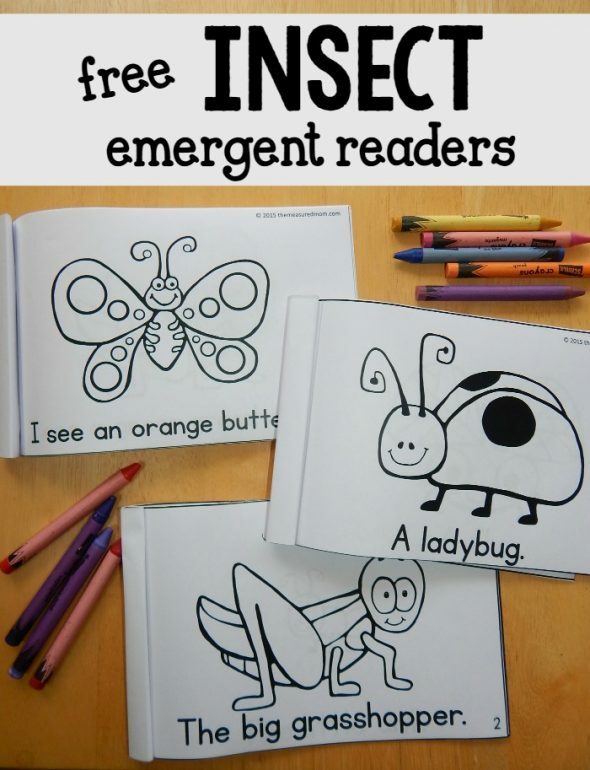 These insect emergent readers are perfect for your child to color and read to you! 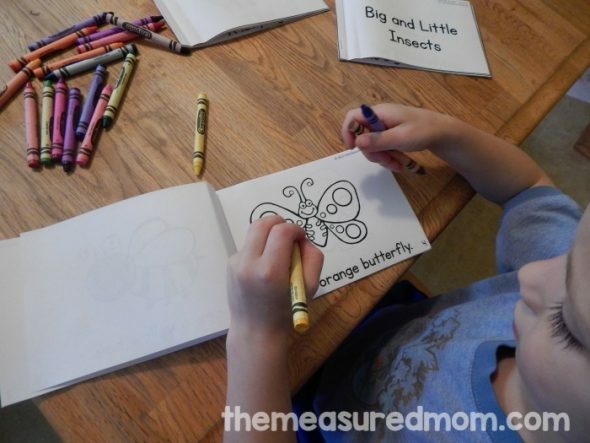 I just love making these little books for my boys to color and read! I’m creating a set of Color Me Readers to go along with each of our early childhood book lists. 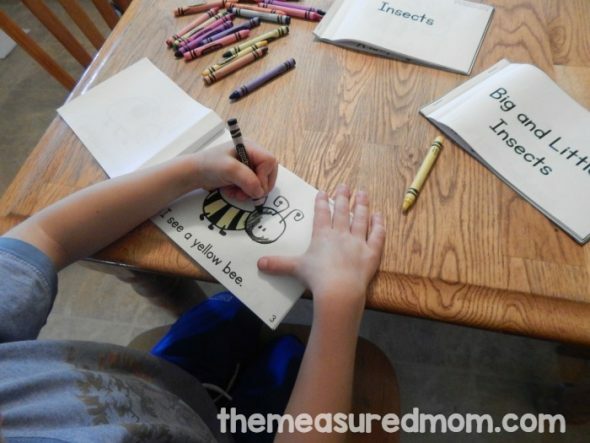 And here are the Insect Color Me Readers! I’ve designed these readers to be used with my preschool boys (just over 3 and almost 5) to teach them more about basic concepts of print. Since my older preschooler (almost five) has a pretty good sight word knowledge and is sounding out three letter words, these books are quite easy for him to read. But he’s always excited to see a new set! Our youngest son (at right, age 3) doesn’t read any words except for his name. But he knows most of his alphabet, so he could “read” the Level One book with me. I pointed out the word “A” and named the insect. He caught on to the pattern quickly and could read the whole book. No, he does not read those insect names in isolation. But he is using picture clues, reading that word “a,” turning the pages in the right direction, and recognizing that the words on the page mean something. Yay for concepts of print! 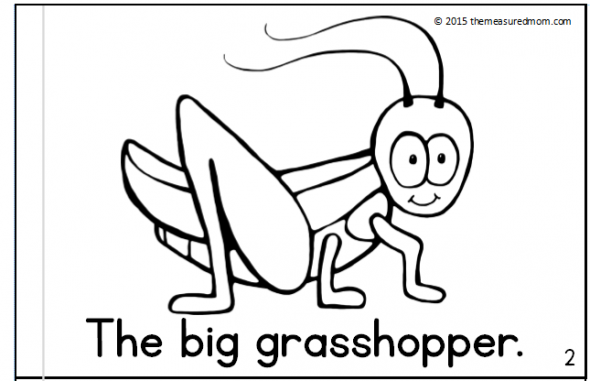 By reading the Level Two book, some preschoolers will start to recognize the words “big” and “little.” Some children will be able to look at the beginning letters of the words and make a good guess at the name of the insect using those beginning sounds. 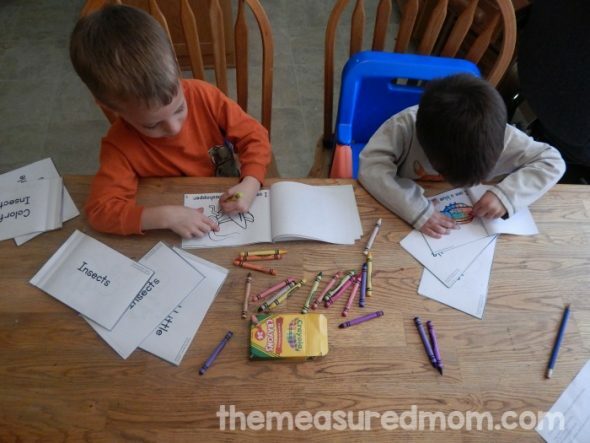 Others, like my Three, will enjoy coloring the books, looking at them, and “reading” on their own. They’ll need you to tell them the names of the insects they don’t recognize. 1. Print the four pages for each book, single sided. 2. Cut along the bold lines on each page. 3. Stack the pages together to make each book. 4. Staple along the left side of each book. Thank you so much for your generosity. Having made some of my own materials I know the time and effort that goes into producing quality material. I really appreciate your ideas, tips and products. You have such great resources! Thank you so much for sharing! I really like your books! I live in Denmark, where we of course speak Danish – would it be okay if I translate your books to Danish and share them? Wow! These are great! Thank you so much for sharing! I can’t open the books for some reason? These books are awesome and so motivating for our beginning readers! Thank you! Thank you very much. They are great. I’m Thai. I am a teacher who teach English. It’s hard and difficult for my students to learn English. 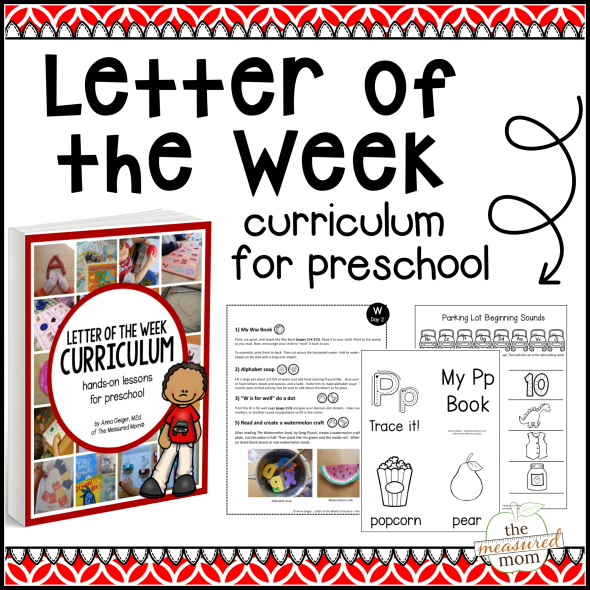 I try to find worksheets and every things to teach them. I’m trying to print the free printable for my daughter and it’s not giving me an opinion to give my email. You don’t need to give your email address to print this. Great and useful materials you have here! You are reaching children around the world. Thank you, Elizabeth – that’s very encouraging! Thank you for creating these. I am unable to print the free insect emergent ready. I click on get your set of books here but it won’t download. There must have been something wrong with my computer. 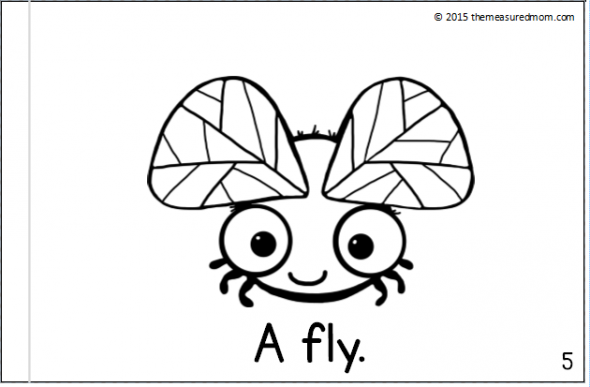 I was able to download those cute insect books. Thank you my error.